Definition at line 2661 of file wined3d_private.h. Definition at line 2663 of file wined3d_private.h. Referenced by wined3d_adapter_init(), wined3d_caps_gl_ctx_create(), wined3d_caps_gl_ctx_create_attribs(), and wined3d_caps_gl_ctx_destroy(). Definition at line 2665 of file wined3d_private.h. Referenced by wined3d_caps_gl_ctx_create(), wined3d_caps_gl_ctx_create_attribs(), and wined3d_caps_gl_ctx_destroy(). Definition at line 2669 of file wined3d_private.h. Referenced by check_fbo_compat(), draw_test_quad(), init_format_depth_bias_scale(), init_format_fbo_compat_info(), wined3d_adapter_find_polyoffset_scale(), wined3d_adapter_init(), wined3d_caps_gl_ctx_create(), wined3d_caps_gl_ctx_destroy(), and wined3d_caps_gl_ctx_test_viewport_subpixel_bits(). Definition at line 2666 of file wined3d_private.h. Referenced by wined3d_caps_gl_ctx_create(), and wined3d_caps_gl_ctx_destroy(). Definition at line 2667 of file wined3d_private.h. Definition at line 2671 of file wined3d_private.h. 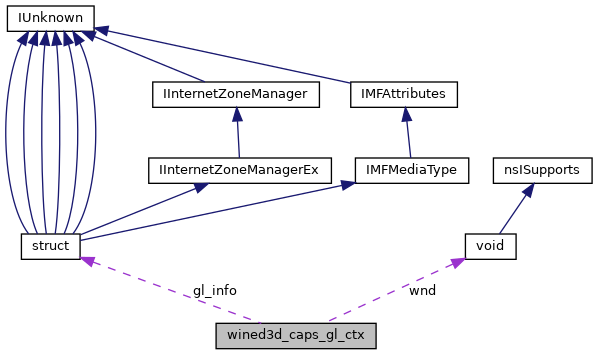 Referenced by draw_test_quad(), and wined3d_caps_gl_ctx_destroy(). Definition at line 2670 of file wined3d_private.h. Definition at line 2664 of file wined3d_private.h.